At Castleknock Cosmetic Clinic Dublin 15 we call crow’s feet “smile lines” or “eye lines,” but these slightly more flattering terms still refer to the same, unavoidable sign of aging: the wrinkles that begin to form at the outside corners of your eyes when you reach your late-twenties. They may show up earlier for people who don’t take good care of their skin and later for those who do. But either way, crow’s feet are all but unavoidable. The skin on our face stretches like a rubber band, thanks to a property called elasticity. This means it can return to its original form after being pulled or compressed, pretty important when you think about how much we move our faces. Regrettably, as we get older, our skin loses its elasticity. That’s why we form wrinkles and certain parts of our body start to droop. One of the main reasons for this is that our bodies’ production of collagen and elastin, two proteins responsible for our skin’s elasticity, and guess what; they lessen with age. One way to avoid crow’s feet would be to never smile, laugh, frown or squint. 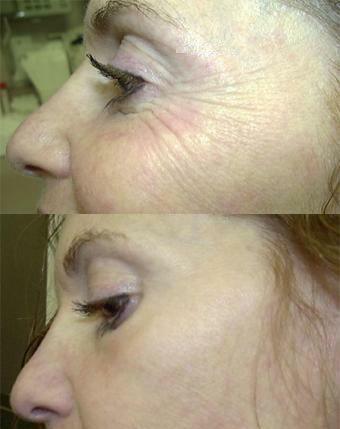 Since that seems next to impossible, most of us have to look into other ways of fending off those fan shaped wrinkles. For starters, you can protect yourself from the sun’s harmful UV rays by using sunscreen. Dr Kahlout (medical director of Castleknock Cosmetic Clinic Dublin) explains that exposure to UV rays are of the most common ways for our skin to lose collagen and elastin, and eventually,their ability to bounce back. If you’re a smoker, you’re even more at risk. Smoking does kick-start the biochemical processes that make your skin to age faster. For some people, creams aren’t enough. But there’s a nonsurgical option at Castleknock Cosmetic Clinic Dublin: muscle relaxing injections for those annoying wrinkles. Crow’s feet are most pronounced when you work the muscles around your eyes, so their appearance is unavoidable when you smile, laugh or squint. Toxin injections literally relax those muscles so they can’t contract. It works by blocking the chemical signal that travels from your nerves to your muscles, telling them to wrinkle. There are different BTXA toxins. Though toxin treatments are generally safe, they can result in complications if the toxin spreads beyond the treatment area, so you should only receive injections from an experienced doctor with good knowledge of facial anatomy and function. The upside of muscle relaxing injection treatment is that it only takes a few minutes. The downsides are that it involves needles and it doesn’t last forever. To break it down, the procedure involves injecting the toxin into specific muscles around the eyes. No anaesthesia is needed as the needle used is a specialised ultra fine needle, however you’re likely to experience some discomfort. After an injection, it may take up to a week to see any results, and those can last anywhere from three to four months. There are some side effects (unlikely in experienced hands) that come with the procedure, including temporary bruising and headaches. While the bruising is rather uncommon, the headaches are rare and should go away over the course of a couple of days. It’s also important not to rub the treated area after an injection for an hour or so. Doing so may encourage the toxin to seep into your eyelid muscles, causing them to droop. Unfortunately, there is a possibility of this happening even if you don’t rub the treated area, but the droopiness fades over time. The bottom line is that while wrinkle injection with toxins can’t completely get rid of your crow’s feet, it will reduce their appearance significantly. If you can tolerate the needles and you’ve got the commitment to get the treatment twice yearly, you can hide those wrinkles with almost no effort on your part. 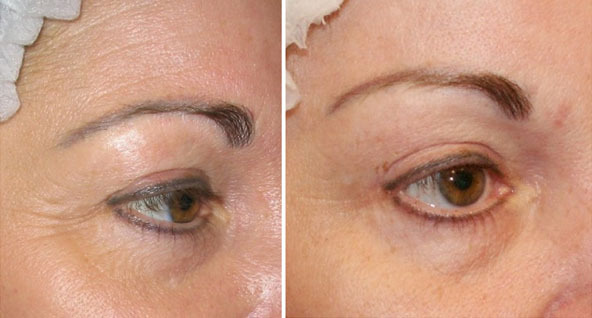 We can lift and soften crow’s feet at the side of the eyes and the more permanent lines around the eyes with the use of dermal fillers. Soft dermal fillers are perfect at softening those early signs of crow’s feet by hydrating and strengthening your skin to with stand the pressure from underlying muscles and the ageing effects of environmental factors. Typically an initial course of two to three treatments would be required producing results that would last 6-8 months. After this single top-ups would maintain the result every 6 months. 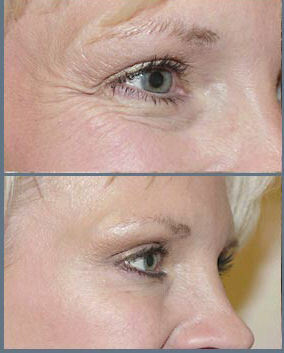 Firmer dermal fillers area better choice for more established crows feet that are always visible. Firmer dermal fillers are more robust and gently mould to your skin giving a very natural result. It is a single treatment that is lasts for up to 10 months. Toxin injections are generally the best option for pronounced crows feet with deep lines, but when the lines are a tad too deep, dermal fillers can be used in combination with toxin injections where a loss of volume needs to be restored to give an improved effect. You can improve the results obtained through dermal filler or toxin correction of crows feet with natural rejuvenation using either the Dermaroller and good skincare routine. Narrow micro laser beams target the skin in the wrinkles causing instant ablation of compacted cells in a controlled treatment zones. The ablated areas are replaced with new collagen under the same process of neocollagenesis. The difference between fractional CO2 laser resurfacing and skin tightening is that the resurfacing procedure is a once off treatment. However, a downtime of a weeks is expected for the healing process to complete. Results are long lasting.